5793 labyrinths found. Showing 5561-5580. Sorted by country, state, city, then zip/postal code. During Holy Week and other special times as it warrants. Check our web site for details. The labyrinth is on the north lawn of the church, under the walnut tree and right near the children's playground. Photo courtesy Myra Ryneheart/Laughing Flower Labyrinth Co.
Myra Ryneheart/Laughing Flower Labyrinth Co.
Myra Ryneheart & Peter Corcorran/Laughing Flower Labyrinth Co.
Second Sundays from 4 p.m. to 6 p.m., in Fellowship Hall - off the Seneca Street parking lot. 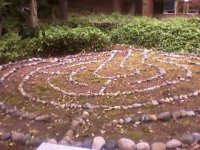 The two labyrinths are located at our house in West Seattle. Upper Parish Hall - Central Seattle, 16th South & South King (1 block E of Rainier Ave, 1 block S of South Jackson St.). Church phone: 206-323-5250. In Beacon Hill neighborhood of Seattle - on bus and light rail line. Currently, labyrinth walks are conducted on the 2nd Sunday of each month from 1 - 4 PM. Normally the first and third Mondays of each month (except holidays) from 1:15 to 4:00 PM. 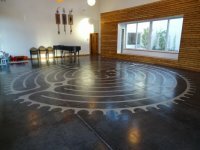 Portable Labyrinth available for rent, schedule available - please contact the Director of Faith Formation. Patio area is wheelchair accessible but paths are pretty narrow. Open during church office hours M-F, 9am - 4pm. and Sundays 8:30am - 1pm. 9 path designed after the Chartres model to fit into our more limited space. Exit River Road, head south, left on E. Silberhorn RD., located on the north side of the road, enter Rock Hollow Farm, at the 'big rock'. Susan and Mike Shaw - Rock Hollow Farm welcomes visitors to walk the trails on it's nearly ten acres. Since creating the labyrinth in the field two years ago we also invite you to enjoy the it's path. The Labyrinth is located in a wooded area to the south of the church. There is a paved path near the main entrance that leads down to labyrinth. There is handrail, but the path is a bit steep for wheelchairs or walkers. Outdoor labyrinth located on south end of the church property - parking available. Labyrinth is in the community garden behind (north of) the church. From the trailhead on Assembly, go north several hundred feet and sign is posted on the left.